Hello, June -- Hello, Summer! The time for al fresco dining, chilled bottles of Rosé, fruity cocktails and impromptu patio parties is upon us. Which also means you need a few quick, easy and impressive dishes for those last minute soirees. Boil potatoes and smash them in a large bowl. In a small bowl, mix together olive oil, lemon juice, garlic powder, red pepper flakes and pepper and salt, then mix into the potatoes. Place potatoes on a greased cookie sheet in one layer and broil for about 10 minutes, or until lightly browned. They should be pretty salty. Remove from oven and let cool. Shred the crab and add to the potatoes. Stir in the cilantro and the mayo. Form into small, bite-sized balls and chill at least an hour. 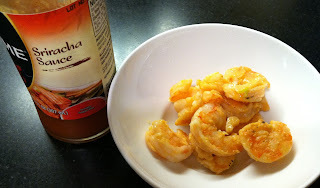 Toss the raw shrimp with the rest of the ingredients and marinate for at least an hour. Bring to room temperature, add 4 shrimp to each skewer and grill 2 minutes per side. Alternately, cook in a skillet on the stove until pink and serve with mini forks. Note: these are pretty spicy. If you or your guests can't take the heat, serve with a dip of sliced scallions stirred into sour cream. Mix all of the ingredients together in a large bowl, cover and marinate in the fridge for at least 1 hour. 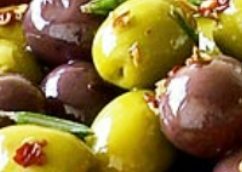 When ready to serve, let the olives come to room temperature, adjust seasonings (more herbs or red pepper?) drain off any juice and spoon into serving bowl. Be sure to set out a small bowl for pits. Serve these snacks with chilled wine or fizzy cocktails. Add a cheese plate with some toothsome crackers or assorted flat breads, a bowl of dried fruit and nuts, some baby carrots or apple slices, and you're on your way to a lovely, stress-free, tasty evening.